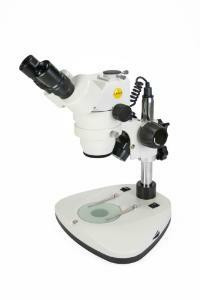 Ideal for educational, laboratory, research and industrial use. This stereo zoom microscope offers the convenience and versatility of viewing items at 10X magnification then zoom continuously to maximum detail at 40X magnification or at any point in between. The upright, unreversed image remains in focus throughout the zoom range. The trinocular head features a port to accept optional video C-mount and SLR camera adapters' included. Note: the incidental and transmitted illuminators incorporate high intensity 3W LED lamps.